Enjoy the thrill of riding a jet ski exploring a spectacular playground off Port Douglas with a guide on hand to help out if you need it. 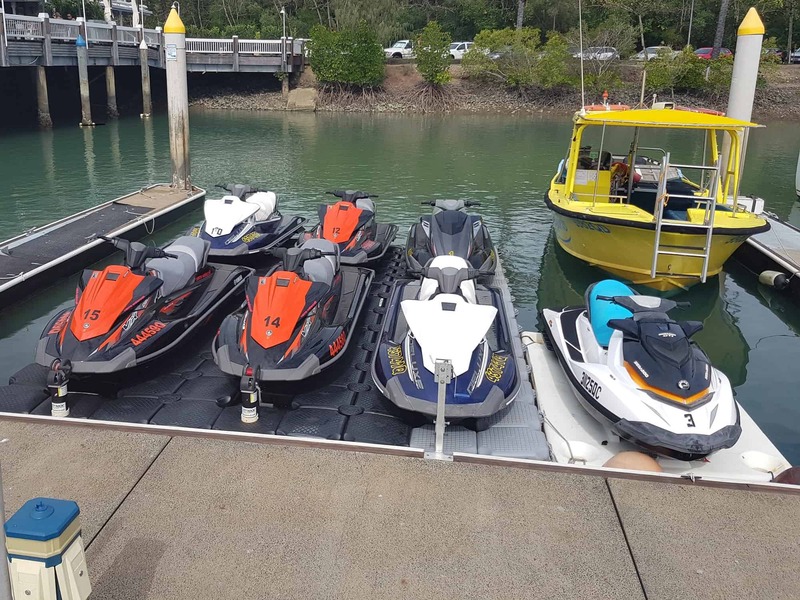 No experience necessary to jet ski Port Douglas with a full safety briefing and demonstration on how to operate the jet skis provided before you set off on your adventure. Choose from one of three jetski adventures. CORAL SEA SPIN – 45-minute Guided Jet Ski Hire (90 minutes) – Gentle cruise alongside the boats in the marina and the iconic Sugar Wharf before hitting the open ocean for 30 minutes of freestyle fun. No compulsory circuit. OCEAN BLAST – 75-minute Guided Jet Ski Hire (2 hours) – Gentle cruise alongside the boats in the marina and the iconic Sugar Wharf before hitting the open ocean for 60 minutes of freestyle fun. No compulsory circuit. 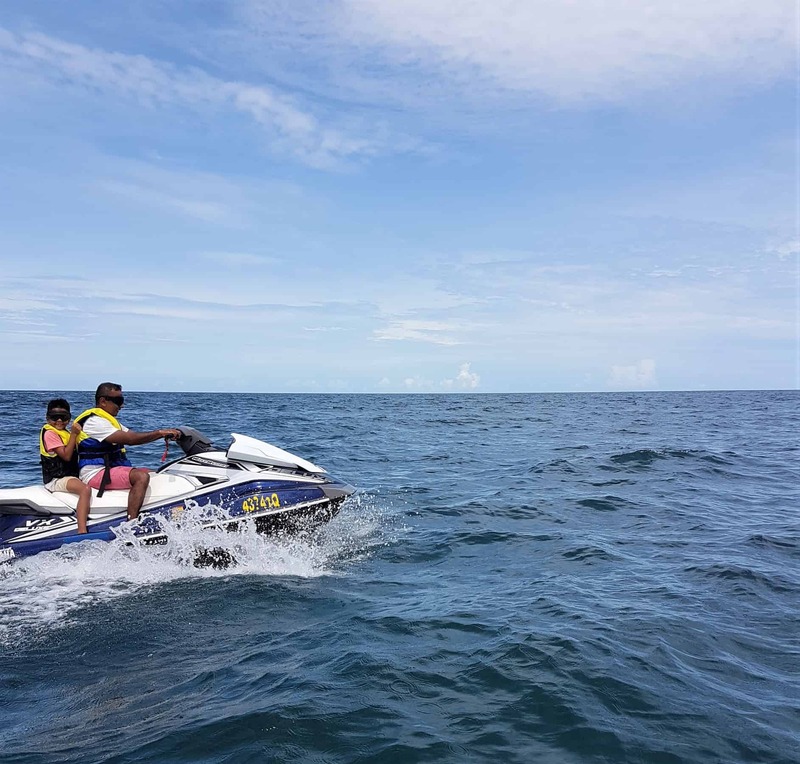 FOUR MILE DISCOVERY – 95-minute Guided Jet Ski Tour (150 minutes) – Action packed tour: Includes Four Mile Beach, exploration of fringing reefs and some freestyle time to cut loose. Bookings need to be made by 4pm the day prior to hire. Morning and afternoon tours and hire are available. Choose AM or PM and the time will be confirmed on booking confirmation. Times may be amended due to weather conditions. There are up to five jet skis available for hire, accommodating up to 10 people riding tandem. You don’t need a licence as you are participating in an organised activity under the supervision of a qualified guide. Stinger/lycra suits are provided free of charge during the summer months (Nov-Apr). Goggles provided. You are welcome to bring your own sunglasses but remember the expensive ones sink fast. You don’t necessarily need to be able to swim to hire a jet ski. All jet skiers are fitted with a PFD (Personal Flotation Devices) which must be worn at all times. However, during rougher weather we would have to evaluate the suitability of a non-swimmer due to safety concerns should you fall off the jet ski. The decision as to whether a non-swimmer should take part in the activity can only be made on the day of the hire once we are aware of the conditions on the water. To hire a jet ski you must be 16 years old but if under 18 you are required to have a legal guardian over 18 complete an indemnity form at check-in. 12-15 year olds may drive a jet ski if accompanied by an adult over 18 years old. The minimum age for a passenger is eight years old. Please note that in rough weather we may have to restrict the minimum age due to safety concerns. There is no maximum age, you just need to be physically capable of riding a jet ski. 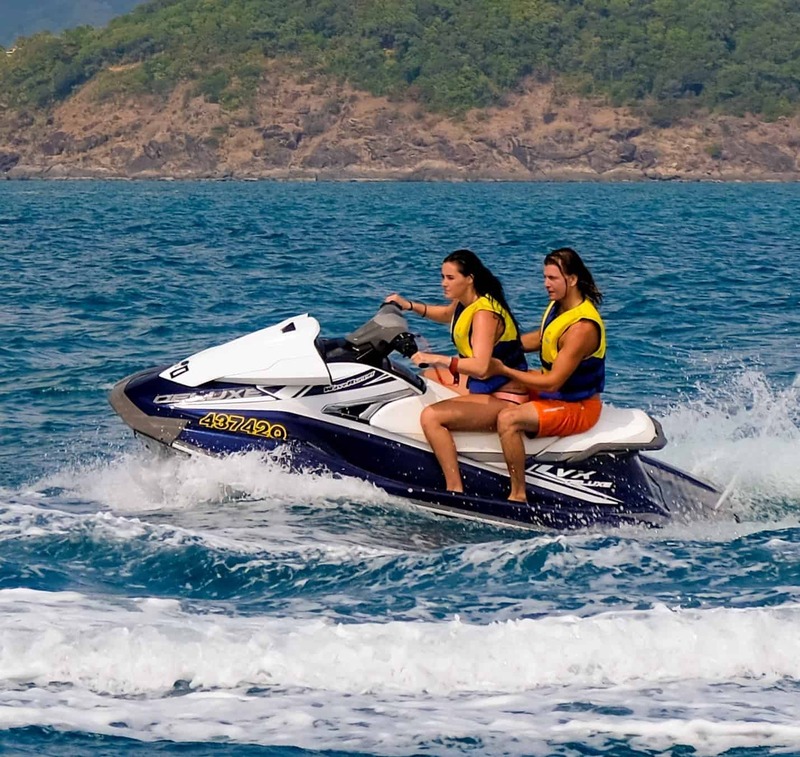 Maximum 2 people per jet ski subject to weight and favourable weather conditions. Maximum 210kg per jet ski. You need to be confident enough in the water to be able to swim back to your jet ski, while wearing a life jacket, should you fall off and be physically able to climb back onto the jet ski with little or no assistance. It is necessary for anyone operating a jet ski to clearly understand English for the safety briefing. If your guide form the view that you will not or cannot operate the jet ski safely during the demonstration your hire can be cancelled. You should allow up to 45 mins on top of your chosen tour duration for safety induction, kitting up & demonstrations. It is easy to swap drivers at any time while out on the water. Once the ski is turned off, you each move to opposite sides of the ski and swap places before reattaching the lanyard key (kill switch) to the new driver. Children aged 12-15 years can have a go at driving but the adult over 18 years will have the lanyard key attached to them so should they fall off, the jet ski will stop. There is not an opportunity to swap passengers over during the hire as you are on open water. You are welcome to leave your belongings in the Uplift Watersports shop which is always manned or locked. You can take small items on the Jet Ski as they do have a small glove box – but we cannot guarantee that this would stay waterproof. Jet skiing is somewhat subject to weather conditions. Some light rain is not usually an issue as you are likely to get wet anyway but we will usually cancel should we experience heavy rain. If winds are under 10 knots the sea is very calm and suitable for all experience levels and ages. 10 knots – 15 knots will usually be a bit bumpy but is still suitable for solo or tandem hire as long as everyone is confident. 15 knots – 20 knots is getting rough and is more suited to solo riders but tandems may be okay if riders have experience or are very confident on the water. 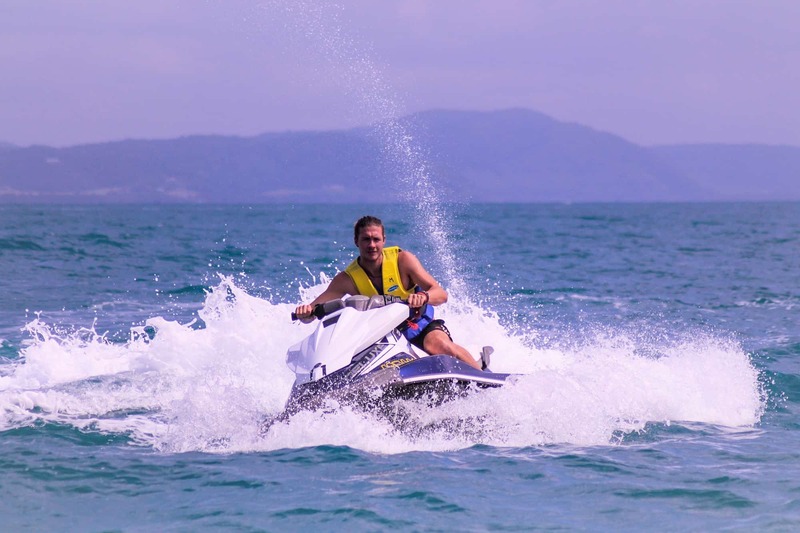 Over 20 knots is only suitable for solo riders with some experience – the call to run in this sort of weather is made by the Jet Ski guide subject to safety. Please note we may need to restrict the child ages based on the weather conditions due to safety concerns. If you have a medical condition that may affect or be affected by riding a jet ski you need to let us know. For example, but not limited to, back/neck issues, epilepsy and diabetes. The severity of the issue in comparison to the weather conditions may result in you not being able to participate. If you have any concerns at all that your medical condition could be adversely affected or exacerbated due to your participation you should not jet ski. Pregnant woman cannot partake in jet skiing. You will be riding one of 5 Yamaha VX Deluxe Jet Skis. Tours depart from Port Douglas Marina. Guests need to check in to the Uplift Watersports shop in the marina for a safety briefing on arrival. You are in safe hands with Rick and Sharon who have 21 years of experience in the tourism industry. 100 per cent cancellation charges apply with no refunds given for same day cancellations. All times and dates can be amended subject to availability and conditions. In the even a jet ski hire must be cancelled by us due to weather or any other unforeseen circumstance then a full refund will be given.